"Following the lead of Newman, Ratzinger has opened Catholic theology to a consideration of the problem of history, but he does not allow the Tradition to be constructed from historical elements external to revelation itself. Consistent with de Lubac and Mohler, he believes that the faith of a twenty-first century Catholic in any diocese of the world is not essentially different from that of a first-century Christian." -- Tracey Rowland, Benedict XVI: A Guide for the Perplexed (London: T & T Clark, 2010), p. 157. The British publishing house, T & T Clark, has recently produced a series of theological reflections under the series title of "A Guide for the Perplexed." This title comes from a book of the famous medieval Jewish philosopher, Moses Maimonides. The perplexed were those Christians, Jews, and Arab thinkers who first re-encountered, in the 12th and 13th centuries, Aristotle and his enormous wisdom. What perplexed them, as believers, was whether the revelation that they lived was not natural. Aristotle seemed to figure out much of it without its benefits. The task, among Christians pioneered by Aquinas, was to distinguish what kind of knowledge that was revealed to us from what kind could we figure out ourselves. The T&T Clark series previously dealt with given writers like Tillich, von Balthasar, Calvin, and de Lubac as well as with Christian topics like the Trinity, Christology, and bioethics. Tracey Rowland's new book on Benedict is part of this series. Rowland, an Australian theologian who studied in Cambridge, has previously written an excellent book on Benedict (Ratzinger's Faith: The Theology of Benedict XVI, Oxford, 2008). This second Rowland book is relatively short (160 text pages). It is designed primarily to situate Benedict as that theologian who best understands modernity and the place of Catholicism in relation to it. Essentially, the pope does not judge the faith by the culture, but examines the intellectual and moral meaning of the faith to ask what, if any thing, does modernity have to do with it. As the pope pointed out in Spe Salvi, many of modernity's most forceful ideas are, when separated out, misplaced versions of basic Christian positions now thought to be achieved by means other than Christian. Without careful analysis, Benedict neither accepts nor rejects the operative ideas of modern times. This caution is in large part because the pope has such a thorough grasp of other times and cultures with which to compare anything in modernity that is said to be contrary to Christianity. Of course, much of it is thus contrary, the pointing out of which is the purpose of this insightful book. The pope examines the elements of culture in the light of both reason and revelation. He does this analysis over against a culture that in many ways denies validity to both revelation and reason. In this sense, the Church and the pope become paradoxically the principal voices of reason in the modern world. Benedict is not easily deceived by dubious theories that seek to reduce faith to culture. But he understands that faith naturally seeks to find expression in local language, ideas, and images, even when its origin is not simply a manifestation of this origin. This endeavor is a service of enormous importance both to the world and to the Church. Rowland displays an enormous amount of reading and reflection on the vast literary work of Ratzinger and of those who have written about him. She spells out the arguments that are said to indicate either a narrowness or elitism in Benedict and puts them in a broader context where they always make sense. "For the second half of the twentieth century (especially since 1968) and the beginning of the twenty-first he has represented Catholic theology in the face of a militant secularism and various crises internally created within the Catholic Church" (152). Thus, the principal question for Benedict is not: "How in the light of modern truths can the stated positions of revelation be explained?" Rather it is: "What in the light of faith is the intelligible meaning of modern ideas and movements?" If it is "modern," it is not, as such, either true or false. That is what must be ascertained. In all of his writings, Benedict has shown the happy facility of carefully getting to the heart of an issue. He wants to know what exactly the Muslim, the relativist, the scientist, the Calvinist, the Hindu, or the Marxist holds. He then seeks to discern how such views came about and to relate them to the truth, including the truth of revelation. The pope is never merely polemical. He lays out an argument with which he disagrees in careful and accurate detail. He gives its history and premises. Nothing is to be gained by not knowing and considering the arguments against your position. But Benedict then responds to what is presented. This book is full of such careful responses. The popular opinion is that Catholicism has no adequate responses to the views leveled against either its truth or historicity. After reading Rowland's book, it quickly becomes clear that the opposite is the case. This opinion includes those within the Church's broader fold whose ideas are skewered from the truth at some point or other. Benedict knows about the small error in the beginning that leads to the large error in the end. What disconcerts many about Benedict is precisely the fact that he does make sense of revelation as a primary source of understanding of man and the world. When included, revelation and reasoning about it explain our lot much more adequately than any of the popular or dogmatic alternatives, with which Benedict is familiar. In each of Rowland's seven chapters, she addresses a particular issue in which Benedict has taken up critical issues said to present some presumably insurmountable barrier between Christianity and truth. She shows how Ratzinger has dealt with these issues—the Romantic reaction to the Enlightenment, the relation between humanism and the Incarnation, tradition, the theological virtues, the relation of history and metaphysics, the place of social thought, and the question of Christian unity. In each of these areas, Ratzinger has made a unique contribution that consists essentially in showing that the basic Catholic solution is the most coherent one in careful comparison to the alternatives presented against it. We are not surprised that this calm approach is not well received in quarters convinced that the views of Catholicism cannot be valid or even seriously considered on either scientific or historical grounds. In each case, as Rowland spells it out, Ratzinger makes the counter case that history, or metaphysics, or Scripture, or science does in fact support what is the basic Catholic position. But, as Rowland describes it, Ratzinger is not writing polemically. Rather he carefully presents the evidence and the basis on which it rests. Whether anyone will accept such arguments is itself something of a personal and spiritual problem. Truth also has to be chosen. What cannot any longer be maintained is that there is no case to be made. Everyone needs to look at the evidence and analysis that clearly show the force of the arguments making sense of it all. Rowland points out that Ratzinger is ever ready to come to agreement with various controversial positions once it is clear that what is at stake is compatible with the faith. Take the classic issue with Lutherans about faith and works. "Ratzinger agreed that while Christians are obliged to do good works, justification and final judgment remain God's gracious acts. The actual wording of the key sentence of the declaration is as follows: 'By grace alone, in faith in Christ's saving work and not because of any merit on our part, we are accepted by God and receive the Holy Spirit, who renews our hearts while equipping us and calling us to do good works'" (139). This happy formula at the same time avoids the issue of Pelagianism, that is, the claim that we save ourselves by our own powers. Ratzinger retains the Pauline and Johnanine teachings about the first necessity of grace in our salvation. One might say this happy result is due both to good will and to careful thinking that clearly understands the whole issue in its principles and in its development. The number of basic issues that Rowland touches on is quite impressive. Behind it all, Ratzinger stands for the fact of God's creation and redemption are realities, the basic ones that, above all others, concern us. The Christian narrative in its outlines is not a myth, nor is it a kind of mechanism that unfolds automatically. The Father is always present in creation and history, acting through the Son and the Holy Spirit for our eternal salvation, the achieving of which is the real drama of human and cosmic history. "The Christian sees in man, not an individual, but a person. According to Ratzinger, 'this passage from individual to person contains the whole span of the transition from antiquity to Christianity, from Platonism to faith.' It completely transcends the logos of the Stoics, since a 'world created and willed on the risk of freedom and love is no longer mathematical'" (126). Rowland sees one of Ratzinger's major accomplishments as that of reconciling ontology and revelation in such a fashion as the integrity of both is retained. A proper metaphysics serves the possibility of revelation. Revelation does not replace the natural order, but it does not divinize it either. Once this background is clear, Ratzinger is concerned with our relation to God, how we serve and worship Him. Rowland is quite blunt in her description of the loss of dignity in liturgy and the effect this has on ordinary believers. Ratzinger is a man who knows and appreciates the importance of beauty in our lives, especially as related to liturgy. Ratzinger stands for dignity, solemnity, beauty, and reverence because he first knows that men are called to worship God. This relatively short book is wide-ranging. Rowland has managed to show the enormous learning of the pope within the context of his now operative papacy in which he is concerned with the Church itself and what it stands for. It does stand for the fact that the Son of Man did take flesh and did dwell among us. There is nothing mythical about this. Moreover, human destiny is not to continue within this world. Each person is constantly being called to eternal life, to nothing less, though what he is offered in our world is mostly "something less." This is his chief temptation that deflects modern man from any real understanding of himself. Much of modernity wants this something less. Rowland is very good in showing how Ratzinger is a thinker who does know what the modern man proposes and the inadequacy of such proposals. Modern man has a difficult time (largely a culpable difficulty, I think) imagining that the Christian position is grounded in both thought and history, and that it does make sense and explain things that are most important to human life. Reading Rowland's account of Benedict is an exercise in the recovery both of our tradition and of our mind. It is not to be missed. Fr. James V. Schall, S.J., is Professor of Political Philosophy at Georgetown University. He is the author of numerous books on social issues, spirituality, culture, and literature including Another Sort of Learning, Idylls and Rambles, A Student's Guide to Liberal Learning, The Life of the Mind (ISI, 2006), The Sum Total of Human Happiness (St. Augustine's Press, 2007), The Regensburg Lecture (St. Augustine's Press, 2007), and The Mind That Is Catholic: Philosophical and Political Essays (CUA, 2008). His most recent book from Ignatius Press is The Order of Things (Ignatius Press, 2007). His new book, The Modern Age, is available from St. Augustine's Press. Read more of his essays on his website. 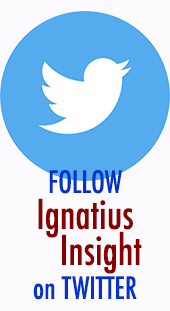 Visit the Insight Scoop Blog and read the latest posts and comments by IgnatiusInsight.com staff and readers about current events, controversies, and news in the Church!